Homekeeping is a fine art. It grasps with one hand beauty, with the other utility; it has its harmonies like music, and its order like the stars in their courses. I fear really good homekeeping –which exhibits itself not in occasional entertainment or a handsome parlor, but in good housekeeping which extends from the attic to the cellar, and through every hour of the year – is far from common. Mrs. Judge Dunwoody, Caroline (pronounced in the French fashion as CARE-o-leen) was a perfect Southern belle. Born before the Civil War in 1841, she grew up in Georgia and made a good marriage to Charles Dunwoody a promising lawyer who served in the state house and was later appointed a judge. His wife became a leading hostess and was well known in the community, often teaching etiquette. In 1866, Mrs. Dunwoody sat down and began to keep a receipt book, or household diary detailing her vast knowledge of homekeeping. She continued the book for fifty years and in that time detailed everything from cooking collards to mending broken hearts, from writing condolence letters to making lip balm, and from serving wine to doctoring a lightening strike. 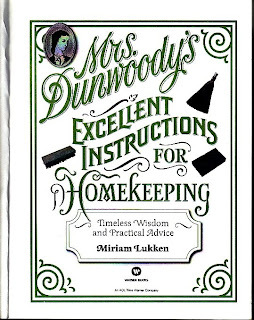 In 2002, Miriam Lukken edited Mrs. Dunwoody’s advice into Mrs. Dunwoody’s Excellent Instructions for Homekeeping. There is, however, the distinct possibility that Mrs. Lukken made up Mrs. Dunwoody. Rarely are there Congressional Hearings on the veracity of "homekeeping" accounts. Even if she is a bit on the fictional side (and what self-respecting Southern belle isn't) her advice is spot on. A lady is never rude to anyone. A lady in public walks wrapped in the mantle of proper reserve, so impenetrable that insult and coarse familiarity shrink from her. A lady carries herself with dignity, but never is such a way to make others think she feels superior to them. A lady is kind to all people, and carries with her a congenial atmosphere which puts all at ease. A lady refrains from discussing anything unpleasant or indecent. A lady does not smoke or bite her fingernails. A lady is always concerned with the health and happiness of those around her and will do everything she can to see that they are properly attended to. A lady is never late (lest it give her suitors time to count up her faults). A lady’s integrity is never at question. A lady understands that inflexibility is the hallmark of the tiny mind. A lady possesses a sense of humor and can easily laugh at herself, but never at others. We believe in Big Mama, though it is hard to believe that Mrs. Judge Caroline Dunwoody, inspirations to belles everywhere would go by the moniker, "Big Mama." Those of us who are close simply call her "Miss Caroline" rhymes with "gasoline".